This Shrek cake is our first attempt at making a cake for Ben. We are very pleased with the out come of the cake. First we made 2 round cakes, then we used the first cake for the bottom half of its head. We then cut the second cake for the top of the head and the ears. We used rolled out icing to cover the whole cake the used a decopage effect to build up the chin and mouth area and the nose and eyebrows. We then painted the face with green food colouring before adding the extra pieces. Then using other colours, they were coloured accordingly. We had tons of fun doing this cake. great looking cake. Job well done. I love the coloring of the cake. Join in and write your own page! It's easy to do. How? 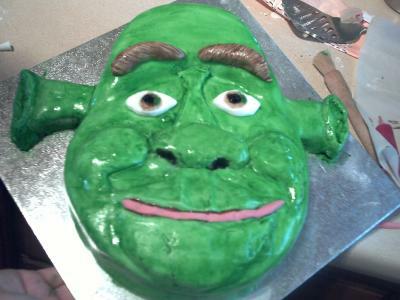 Simply click here to return to Shrek Birthday Cakes.